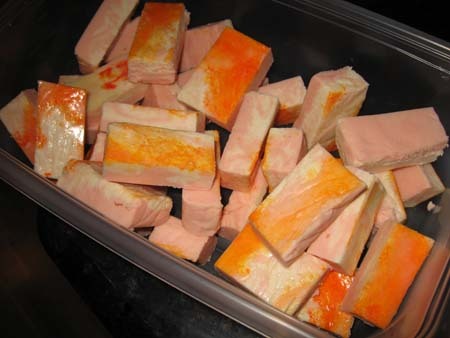 Years ago, I searched the Internet for a recipe for “orange creamsicle fudge”. I’d seen it at a store in Fredericksburg, TX and wanted to duplicate it for my stepmother who loves the flavor combo of orange and vanilla. The recipe I found was a bit hard to decipher, but the end result was an orange fudge that my stepmother loved. I re-wrote the recipe a bit and posted it on Recipezaar. Some people raved about it and others thought it was too sweet. Today, I decided I’d try to revamp the recipe by making it clearer and cutting down on some of the sugar. I also changed the technique a bit. The new fudge is so much better than the old – it’s creamy and smooth has the right level of sweetness. If you make it following these directions, please let me know how it turns out. This is the first time I’ve done it this way. I can’t wait to take this new and improved version to my step-mom on Christmas. Note: The only thing to watch carefully is the temperature. I took mine off at 240. It left a brown burn film on the pan, yet the fudge didn’t taste the slightest bit burnt. I think I should have taken it off at 235 degrees F, so below I have revised it a bit. The new recipe is written below, but here’s a quick play-by-play. After you’ve lined a 9 inch square pan with foil, you get your marshmallow chips and crème ready by putting them in a big bowl. 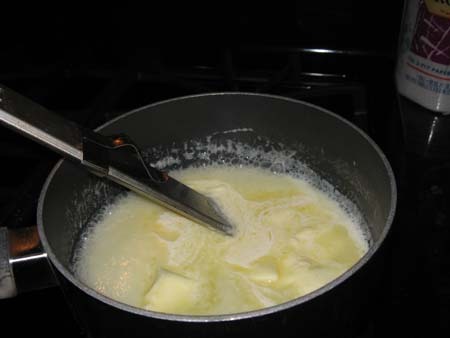 Next, you heat the sugar, cream and butter in a saucepan over medium heat. When mixture reaches a good solid 235 degrees F., it looks like this…. …at which point you remove from heat and pour into bowl with chips and marshmallow creme. Stir well. Quickly scoop out a cup and set in a smaller bowl. Add orange extract and food colors to mixture in larger bowl. Stir until it reaches an orange hue, then pour it in the lined pan. Pour the white (the stuff you scooped out) over the orange and swirl the best you can. As you see, I kind of messed up with my food coloring and it was pink and white…not to mention grainy looking on top. Ugly as it was, it seemed to be miraculously smoothing out. Just for fun, I brushed some orange food color over the top so people would be aware that it was orange flavor rather than cherry or strawberry. I let it cool for about half hour, then chilled it for about an hour. Lifted it, scored it and wow! It’s great! 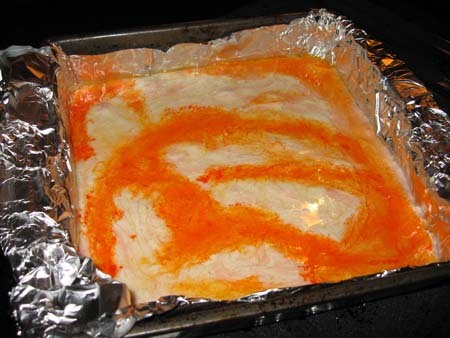 Line a 9 inch square pan with foil and spray foil with cooking spray. 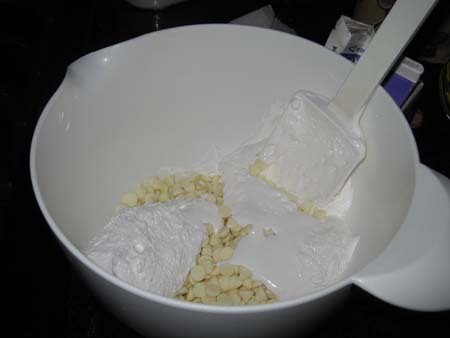 Place marshmallow crème and white chips in a large mixing bowl. 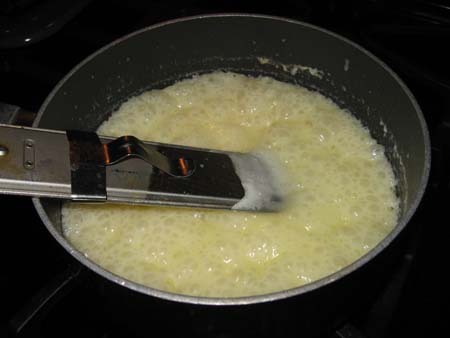 Combine sugar, cream and butter in saucepan. Turn heat to medium and cook, stirring once or twice, until mixture reaches 235 degrees F. Pour hot cream mixture into mixing bowl with chips and marshmallow crème. Beat a few times with a wooden spoon. Remove 1 cup of mixture and set aside. Stir orange extract and orange food coloring into mixture which remains in bowl. Pour orange mixture into prepared pan. Pour white mixture on top. Drag a knife through both to make swirls. Let cool to room temperature (about 40 minutes) then chill for one hour or until set. 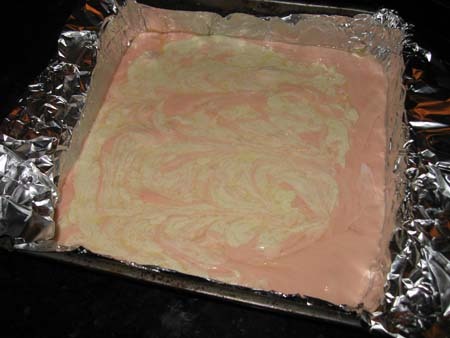 Lift fudge from pan using foil handles and using a large knife, score into squares. FYI. There’s a highly rated recipe for Marshmallow Fluff on Recipezaar. I haven’t tried it, but the recipe makes quite a bit and if you have the ingredients on hand, it might be worth a try. Rachel, thanks for trying it. I have to admit, I almost want to try adding a bunch of extract so I can get a big burst of vodka like steam. For some reason that sounds appealing to me right now ;). I have looked high and low for this recipe! Thanks for providing a version that has less sugar than other sites have provided. The only change I had made to your recipe was adding the extract to the hot sugar and butter. This burns off most of the alcohol in the extract without losing the “dreamcicle” flavor.Be cautious though,add 1 TBSP. of extract at a time! All at once will provide a potent burst of vodka-like steam that will take your breath away! (I found that out the hard way!) The recipe is being given as gifts,loved at christmas parties and gobbled up here at home.Thanks again! I’ve never used orange oil in this recipe, but it’s supposed to be about 4 times the strength of the extract. So start with about 3/4 teaspoon and taste. Thanks for posting your cookie adventures! This fudge looks good! I had a question – I have orange oil, but no orange extract. Do you have a suggestion as to how much orange oil I should use to replace the extract in this recipe? I’m going to give this a try (maybe for xmas cookie tray) after I hear back from you. Thanks very much! Glad you liked the cheesecake. Some recipes tend to crack more than others. A few tips to help prevent cracking (other than water bath baking) are not to overbeat your eggs, make sure all ingredients are at room temperature when you get started and grease the sides of your springfrom pan. If sides of the cheesecake hold on to the pan while the middle expands, it will crack. TG, glad you like the picture heavy post. Maybe I’ll try for more pictures in 2007…..although I think I promised that in early 2006. Everyone loved the fudge. I am really interested in hearing how this version worked for others, since I changed it so much (reduced it by 2 cups of sugar). cool, thanks for posting the SL link. also, i love this posting (ie, the fudge) – love your comments/ description, and the pix too. recipe-writing at its very best! Hey Anna! That fudge looks great. If only I had seen it earlier in the day. 🙂 But onto the real reason I’m commenting. I made The Best Cheesecake Ever on Friday. I decided to try it out on my family before I make it for my fella for his birthday. Cheesecake is his favorite. Anyway, EVERY single family member commented at least twice how good it was. Some even said it after every bite! So I just wanted to say thanks for posting such a great recipe! If only I could figure out how to keep it from cracking! ARGH! If you find out, PLEASE post your method! Let me know if you try it. The old version was similar, but used 3 cups of sugar. on your fudge recipe: that is two thirds CUP of cream, right? Now that I can comment, want to say I’ve been reading your blog for quite a while and enjoy it SO MUCH. I hadn’t looked it up on the SL site. For anyone interested, here’s the link. Gigi, I see what you mean. To get the filling recipe, you must click on the red link that says “filling”. I hate to get off topic…but I just checked out your recipe for the Over the Top cake. Am I losing my mind or is white chocolate missing from the recipe?! Thanks for telling me, K! I hope they like the cake. It is in the current issue of Southern Living and is called Over the Top Peanut Butter White Chocolate Cream Cake. I wanted to make a cake for Christmas, but my step-family wants pecan pie, so that’s what I’m making today. Fuzz’s fever finally broke. She’s been really sick, but seems to be on the mend. Hey Anna, the fudge looks great! Just wanted to tell you that today at work two middle-aged men were shopping off a recipe in a magazine and I helped them find white chocolate. I asked to see the recipe and they were making your SL Peanut Butter Cake. I said “hey! That’s my friend’s recipe.” They thought it was pretty cool to know a great cook like you.